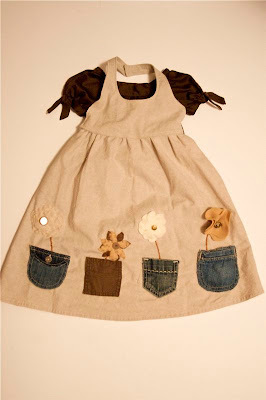 Pocket Full of Posies Dress! 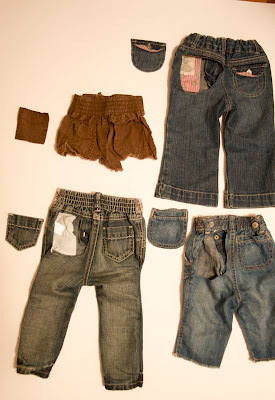 What to do with all those cute little pairs of jeans that your kids have grown out of? 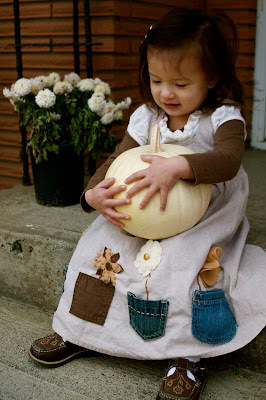 Put them on a little dress, of course! I've been meaning to try this for so long, and I'm glad I finally did! Cute, cute! 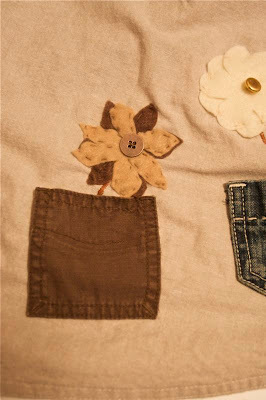 Hand stitch your pockets and flowers on. 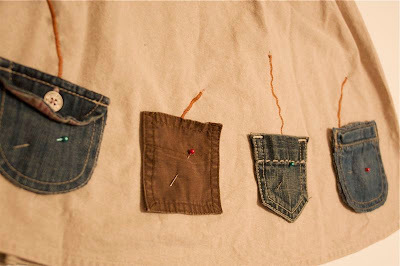 You can also do this on your machine, if it can handle the thick denim (and if you want to mess with changing the thread color for every pocket!)! Last step: admire the cuteness!! 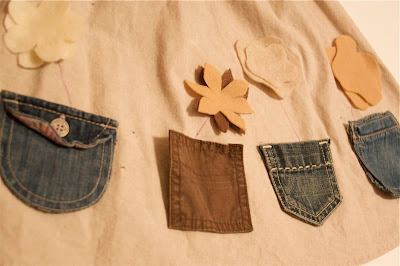 It would be cute to use big-people pockets, too! You could use them for all sorts of things! Oh my gosh! I can't believe how cute this is? Where do you get all of your ideas, or are you just naturally creative? That's so cute! It's even cuter once you see it on her! 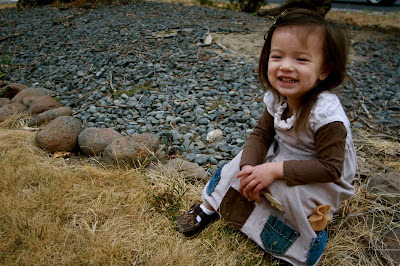 what a cute dress and a cute little girl! love what you layered it with - and those shoes! how sweet! I just found your site via craftig. I love it! This is such a cute idea! Suas ideias são muito interessantes! 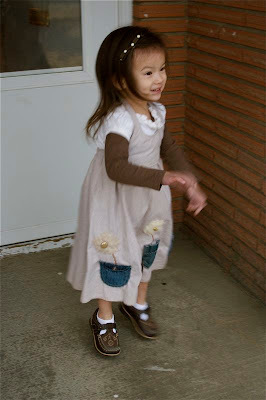 That is the cutest dress EVER! 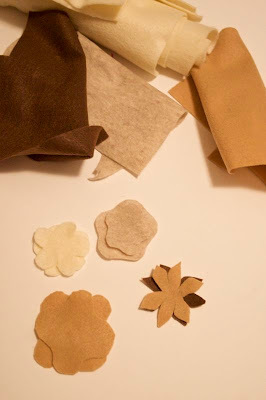 It makes me wish I sould sew! My three girls would go crazy over something like this. 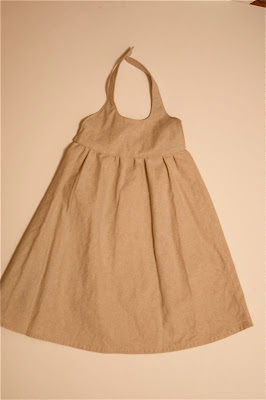 Maybe I can find a simple dress and sew on pockets. Thanks for sharing! That is such a cute and unique dress ever! I love your blog! That is such a great idea! 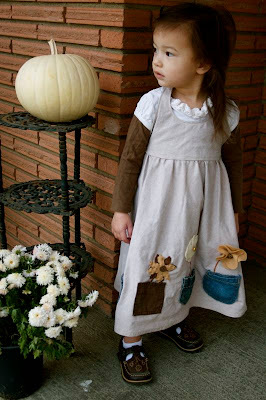 I hope I can slow down enough to make that for my daughter! Absolutely adorable. I love seeing how other people come up with ways to use "old" stuff. Great job! Makes me want to be a little girl again just so I can wear it! You did a very good job both on the tutorial and the dress. I want one for myself!!! 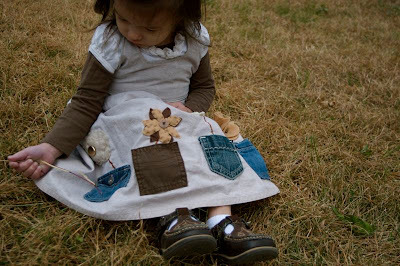 What a great idea, I love the variety of pocket shapes and textures, and your daughter looks adorable! 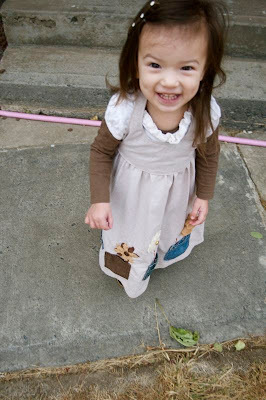 She is adorable and you are SUPER talented! I would love a tut for the dress!!! Or at least what (if any) pattern you used!